Friendly Crossways has been family owned and operated since 1963. The second generation owners decided to offer the property for wedding weekends because we saw too many venues providing couples with cookie cutter wedding services. Our facility is wonderfully suited for the couple looking for a relaxed, rustic chic country atmosphere with plenty of time and space for family members and guests to meet, mingle and make your outdoor wedding celebration a memorable one. Think of us as a destination wedding venue without the really long airplane flight! Our wedding facilities are kid friendly and wheel-chair accessible. We’re only 30 miles from Boston, but once you drive up to our renovated New England barn and carriage house, and breath the really fresh air, you’ll immediately feel those pre-wedding stresses start to disappear! We understand that choosing from a wide variety of beautiful Massachusetts outdoor wedding venues can be daunting, so we hope the following information (including FAQs, preferred vendors and a floor plan at the bottom of this page) about holding a wedding ceremony and reception with our beautiful barn in the background will help make your choice easier! Our wedding package includes exclusive use of our 25-acre property for three days and two nights, with lodging and much more! Many unique, romantic outdoor ceremony sites including a wooded glade, on top of a giant glacial boulder, under a maple tree, or on a lovely green lawn, bordered by stone walls and cream colored hydrangea. Ability to host your rehearsal dinner and/or post-wedding brunch on site. Bridal Suite for preparation and overnight. Accommodations for 27 people per night in our cozy rooms. As many as 35 more guests can be lodged for an additional charge. Use of our magical fire circle on Friday and Saturday nights. Area for a tented reception for up to 150 people (tent & associated rentals are additional). Beautiful handmade bar and coolers for the reception. Parking attendant prior to the ceremony. Use of the dining hall (seats up to 60 guests), meeting space, and the kitchen for non-reception meals. Access to our experience in hosting over 80 weddings. Planning a wedding is a big deal. We make it easier for you by offering the services that are basic to all destination weddings (i.e. venue, lodging, reception tent, catering, bartending). This provides a substantial framework from which you can branch out with the fun, creative stuff that is unique to your vision. Property Rental, including your choice of ceremony site, fire circle and lodging for up to 27 people for both nights, start at $5,697 for 3 days and 2 nights. Custom Designed Tents start at $2,400 for 60 people and $4,200 for 150 people (the maximum guest count). Catering Friendly Crossways chef-owner, Mary Helan Turner, and Nick Chunias, chef-owner of Juliana’s Catering, have designed a unique menu which features a variety of their specialties which lend themselves to a fabulous reception meal prepared fresh on site. The menu combines Friendly Crossways’ farm to table offerings (with organic produce grown right on our property) with Nick’s longstanding tradition of house made Mediterranean themed meals. Friendly Crossways can also cater your non-reception meals or you can self-cater. Bartending Service is separate service provided by Friendly Crossways including bartenders serving from a rustic, handmade bar. Reception beer, wine, hard cider, champagne and soft drinks are provided on a consumption basis, in consultation with Nick, and paid by the host. BYOP for your rehearsal dinner if you wish. Hard liquor is not allowed on the premises. 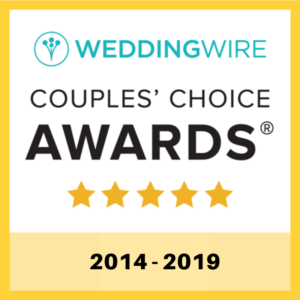 We really liked working with these vendors; they are flexible, hardworking, professional and respect “our” couples. Accommodations in our renovated Barn, Hayloft, and Carriage House. What services does your weekend wedding venue provide? A wedding weekend at Friendly Crossways includes the gift of time to relax with friends and family. On site lodging for up to 62 people coupled with your hosts’ flexibility means you can do-it-yourself as little or as much as you want when it comes to getting those friends and family involved in decorating the tent or using the kitchen to prepare a leisurely breakfast on your special day. Wind down in the evening by the fire circle. Friendly Crossways has a variety of outdoor wedding ceremony venues including a “cathedral in the pines” wedding glade, open lawns, old apple orchards, perennial gardens and New England stone walls. There is space for a tented reception and lawn games outside and rehearsal dinner and brunch inside a century old barn. This was a working farm and a corn field, blueberry orchard and an organic vegetable garden are still productive. We’re inviting you to our home. It’s charming, warm, homey, rustic, chic, beautifully landscaped with plenty of space for fun and games, and only 30 miles from Boston! What religious affiliations does your venue serve? Friendly Crossways is nondenominational and ecumenical. Yes. The owner-chef will design a menu with your specific needs and budget in mind frequently incorporating her farm to table honey and organic fruit and vegetables. Starting in 2018, couples may choose between the catering services of our owner-chef and those of our one exclusive catering partner, Juliana’s Catering. In 2019, it is anticipated that Juliana’s Catering will be providing all reception meals, and our chef-owner will concentrate on providing rehearsal dinners and brunches. Sometimes, if your heart is set on a menu that we can’t provide. Additional fees will apply. Do you offer an on-site wedding consultant? Wedding couples may purchase and bring in their beer & wine. They must provide host liability insurance. Hard liquor is not allowed on our site. We provide a parking attendant on the ceremony day. We have parking on site for 25 cars and overflow parking nearby for another 50 cars. The owners have over 30 combined years of experience in coordinating complicated events (like wedding weekends) in a harmonious manner. Our wedding couples get the benefit of that experience. 150’ish outdoors for a tented reception. 62 indoors for a sit-down dinner in the dining hall or ceremony in our “cathedral hall.” Lodging for up to 62 people. Do you rent other items such as linens, tables, or flatware? Yes: tent, tables, chairs, dance floor, napkins & table cloths are rented through our EXCLUSIVE tent rental company Special Events of New England. As your caterer, we would be responsible for providing tableware (china, glass, silver) and everything necessary to prepare and serve your reception meal. Can you provide a coat check? No. But coats are hardly ever necessary during our wedding season which is mid-May to mid-October.